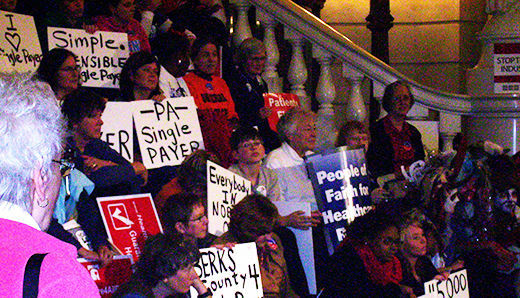 HARRISBURG, Pa. — Close to 1500 Pennsylvanians packed the main Capitol rotunda recently to call for passage of a bill that could make their state the first in the nation to put a single payer health insurance plan in place. 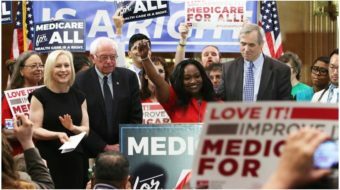 Following the rally, the crowd broke into smaller groups, and many headed for the offices of key legislators to urge support for the two key bills which would bring a single payer plan to the keystone state. 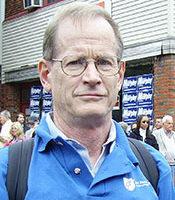 House Bill 1660 and its companion Senate Bill 400 have the support of organizations ranging from PNHP and the Progressive Democrats of America to the Pennsylvania AFL-CIO, represented at the rally by its president Bill George, to the nonpartisan League of Women Voters. Governor Ed Rendell has said he would sign single payer legislation if it reaches his desk. Diane Mohney also contributed to this article.